Soooo excited for my 12 days of giveaways! #mtbcHoliday I will be posting a new giveaway video for the first 12 days of December…items for the home, for mommy, for baby and for kids. Be sure to check back everyday to enter and I will be selecting a winner within 2 days after each giveaway and announcing it on my snapchat (and will message/email the winner too). 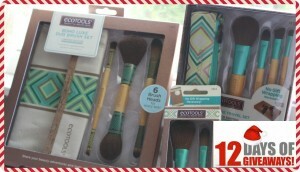 Day 6 is for EcoTools Make up brushes! One winner will win all 3 Holiday sets shown in my video! Be sure to enter my previous giveaways too! Enter below on Rafflecopter or click here. 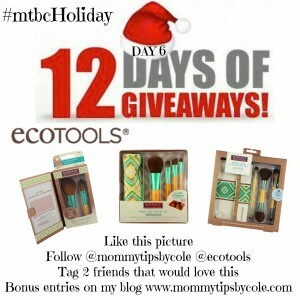 28 Responses to "EcoTools Makeup Brushes (Holiday Sets) | 12 DAYS OF GIVEAWAYS: Day 6 | #mtbcHoliday"
Three brushes look great. I’m due for a new set. Thank you! Love all your videos and vlogs and giveaways. Thank you so much for your hard work and effort thanks Nicole! Great giveaways. I’ve never tried this brand! So pretty make-up brushes sets,I never try make up brushes before,I only used foam brushes,it seems when you use the eco tools,it appplies beautifully and natural flawless,thank you so much for sharing the love giveaway opportunity,happy holidays,good luck everyone. Would love to win these and try them out….thank you for chance to win these awesome prices! Love the new colors! Great giveaway, thanks so much for the chance! I am looking to start putting on more makeup so these will be very helpful to have. Thank you for hosting this giveaway. Love your giveaways… Hope I could win atlease one, specially this brush set…. Need this badly… Thanks…. I have always wanted to try these brushes, they look so nice! This brush set is adorable! What I would give for a new set of brushes right now. Thanks for the opportunity. Love ecotools! Love the new designs of these! Love EcoTools. Great brushes at affordable prices. I love EcoTool makeup brushes! They are the only brushes I use. Would love to be able to add these holiday sets to my collection. Thanks for doing this giveaway! I LOVE these brushes…they’re so bohemian. And don’t even get me started on the packaging…I’m a sucker for good packaging!! Great job Eco Tools. You never disappoint! !